Our Basic Chemical Engineering Tests allow you to experience an online examination in the real-time environment. In every online test on Basic Chemical Engineering, you will be presented with Multiple Choice Questions (MCQs) which will test your skills in Basic Chemical Engineering Concepts in a detailed and comprehensive manner. In the test, each question will have 4 options to choose from. You should select only 1 correct option as an answer and then move on to the next question. Once you submit answers to all the questions, you will be given your final test score. In the Online Basic Chemical Engineering Test, for every correct answer, you will be given 2 points. There will also be negative marking of -1 for every wrong answer. So, you will have to be more careful in choosing the answers to the question in your online examination. If needed, you should skip to the next question and come back to the previous question later so that you can do proper time management for the online mock tests. 1. "Basic Chemical Engineering Practice Tests" - In Basic Chemical Engineering practice tests, there will be a series of practice tests wherein you can test your Basic Chemical Engineering concepts on every chapter separately. There will not be any time limit on these tests. So, Basic Chemical Engineering Practice Tests should be the first set of tests which you should attempt. Goto these practice tests here. 2. "Basic Chemical Engineering Mock Tests" - In Basic Chemical Engineering mock tests, there will be a series of mock tests wherein you can test your Basic Chemical Engineering concepts on every chapter separately, but there will be a fixed time limit per test. So, it is similar to Basic Chemical Engineering Practice Tests, but with an added constraint of time limits. 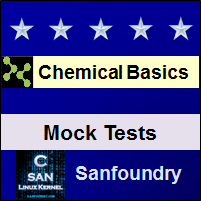 You should try Basic Chemical Engineering Mock Tests if you are appearing for any online examination soon. Goto these mock tests here. 3. 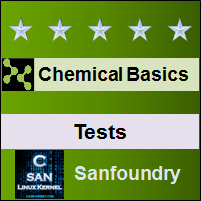 "Basic Chemical Engineering Certification Test" - Once you are through with your Basic Chemical Engineering concepts, then you should try our Basic Chemical Engineering Certification Test wherein Sanfoundry will issue a free Certificate to you if you scored either Grade A* or Grade A in Basic Chemical Engineering Certification Test. Goto Basic Chemical Engineering Certification test here. 4. "Basic Chemical Engineering Internship Test" - If you are interested to do Internships in Basic Chemical Engineering at Sanfoundry, then you must take our Basic Chemical Engineering Internship Test. 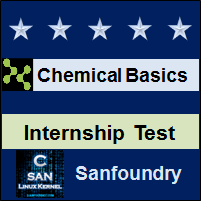 If you scored either Grade A* or Grade A in Basic Chemical Engineering Internship Test, then you are eligible for Internship at Sanfoundry in Basic Chemical Engineering. Goto Basic Chemical Engineering Internship test here. 5. 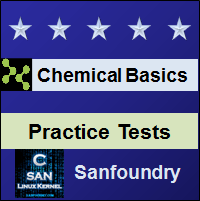 "Basic Chemical Engineering Job Test" - If you are a fresher, a dropout, an experienced person and if you know Basic Chemical Engineering well and looking out for jobs in Basic Chemical Engineering domain at Sanfoundry (or our Network of Companies), then you should try and qualify our "Basic Chemical Engineering Job Test". 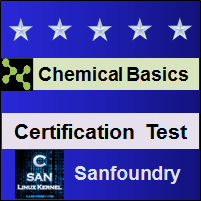 If you scored either Grade A* or Grade A in Basic Chemical Engineering Job Test, then you are eligible for a Job at Sanfoundry (or our Network) in Basic Chemical Engineering domain. Goto Basic Chemical Engineering Job test here. For every "Basic Chemical Engineering Practice Test", Total Questions: 20, Total Time: Unlimited. For every "Basic Chemical Engineering Mock Test", Total Questions: 20, Total Time: 20 Minutes. For "Basic Chemical Engineering Certification Test", Total Questions: 50, Total Time: 1 hour. For "Basic Chemical Engineering Internship Test", Total Questions: 50, Total Time: 1 hour. For "Basic Chemical Engineering Job Test", Total Questions: 50, Total Time: 1 hour. Before you get started on these series of online tests on Basic Chemical Engineering, you should learn, study and practice our collection of 1000 MCQs (Multiple Choice Questions and Answers) on Basic Chemical Engineering here. We also prefer that you should practice Basic Chemical Engineering practice tests and mock tests completely before attempting the certification test. Here is the list of online practice tests and mock tests on Basic Chemical Engineering. Each online test focuses on a "Specific chapter of Basic Chemical Engineering". So, you should try both practice test and mock test on every chapter to do a self-assessment of your knowledge (along with time-limit constraints) in every area or sub-topic of Basic Chemical Engineering. Basic Chemical Engineering Certification test, Internship test, and Job Test are mentioned at the end of this list. 1. Basic Chemical Engineering Test 1 – This set of online test on “Basic Chemical Engineering” tests your skills on The Mole, Density, Specific Gravity, Flow Rate, Mole Fraction and Mass(Weight) Fraction, Analyses of Multicomponent Solutions and Mixtures, Concentration. 2. Basic Chemical Engineering Test 2 – This set of online test on “Basic Chemical Engineering” tests your skills on Temperature, Pressure Units, Measurement of Pressure, Differential Pressure Measurements, Material Balance Concept, Open and Closed Systems, Steady-State and Unsteady-State Systems. 3. Basic Chemical Engineering Test 3 – This set of online test on “Basic Chemical Engineering” tests your skills on Multiple Component Systems, Accounting for Chemical Reactions in Material Balances, Material Balances for Batch and Semi-Batch Processes, Problem Solving Strategy, Solving Material Balance Problems for Single Units, Stoichiometry, Stoichiometry Applications Terminology. 4. Basic Chemical Engineering Test 4 – This set of online test on “Basic Chemical Engineering” tests your skills on Species Material Balances, Processes Involving Multiple Units, Element Material Balances, Material Balances Involving Combustion, Material Balances Problems Involving Multiple Units, Recycle without Chemical Reaction. 5. Basic Chemical Engineering Test 5 – This set of online test on “Basic Chemical Engineering” tests your skills on Recycle with Chemical Reaction, Bypass and Purge, Ideal Gas Law, Ideal Gas Mixtures and Partial Pressure, Material Balances Involving Ideal Gases, Compressibility, Equations of State. 6. Basic Chemical Engineering Test 6 – This set of online test on “Basic Chemical Engineering” tests your skills on Modeling and Predicting Vapor Pressure, Saturation, Condensation, Partial Saturation Terminology, Material Balance Problems Involving Partial Saturation, Gibbs Phase Rule, Vapor-Liquid Equilibria in Binary Systems, Liquids and Gases in Equilibrium with Solids. 7. Basic Chemical Engineering Test 7 – This set of online test on “Basic Chemical Engineering” tests your skills on Energy Balances Terminology, Energy Types, Potential Energy and Kinetic Energy, Internal Energy and Energy Conversion Concept, Energy Balances for Closed, Unsteady-State Systems, Energy Balances for Closed, Steady-State Systems, Vaporization and Energy Balances for Open, Unsteady-State Systems, Phase Transitions. 8. Basic Chemical Engineering Test 8 – This set of online test on “Basic Chemical Engineering” tests your skills on Heat Capacity Equations, Simplifications of General Energy Balance, Solving Energy Balance Problems, Application of the Energy Balance to Closed Systems, Application of the Energy Balance to Open Systems, Standard Heat (Enthalpy) of Formation, Heat (Enthalpy) of Reaction, Merging Heat of Formation with Sensible Heat of Compound. 9. Basic Chemical Engineering Test 9 – This set of online test on “Basic Chemical Engineering” tests your skills on Heat of Combustion, Degrees of Freedom Analysis, Energy Balances Application in Processes, Ideal Reversible Processes, Efficiency, Mechanical Energy Balance. 10. Basic Chemical Engineering Test 10 – This set of online test on “Basic Chemical Engineering” tests your skills on Heat of Solution, Dissolution and Mixing, Effects of Mixing into Energy Balance, Humidity (Psychrometric) Chart, Applications of Humidity Chart, Degrees of Freedom Analysis in Steady-State Process, Solving Material and Energy Balances Using Process Simulators, Unsteady-State Material and Energy Balances. 11. Basic Chemical Engineering Certification Test - This set of online free certification test on "Basic Chemical Engineering" tests your skills on all areas (all chapters, topics and subtopics) of Basic Chemical Engineering. 12. Basic Chemical Engineering Internship Test - If you scored either Grade A* or Grade A in our Basic Chemical Engineering Internship Test, then you can apply for Internship at Sanfoundry in Basic Chemical Engineering. 13. 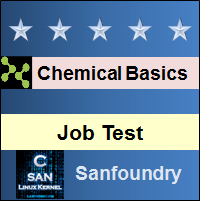 Basic Chemical Engineering Job Test - If you scored either Grade A* or Grade A in our Basic Chemical Engineering Job Test, then you can apply for Jobs at Sanfoundry in Basic Chemical Engineering domain. Best Wishes for your Basic Chemical Engineering Tests!